Professional pricing is available upon sign in and authorization. Already have a professional account? Suntheanine® brand L-theanine is an amino acid that helps promote relaxation and reduces stress. * It's free of the side effects commonly associated with other relaxing agents and can be used to aid in stress management. A patient's ability to respond to occasional anxiety has the potential to interfere with the enjoyment of life and even the ability to perform ordinary daily activities. In addition to lifestyle and behavioral modifications, supplementation can also play a role in supporting a balanced mood. 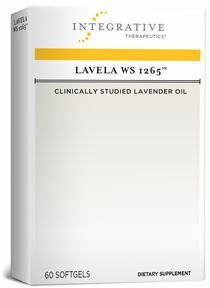 Why is canola oil used in Lavela WS 1265? Since the proprietary lavender oil Lavela WS 1265 is not soluble in water, it must be delivered in an oil-based carrier. Canola oil was selected because it is one of the healthiest oils available, with a beneficial ratio of monounsaturated, polyunsaturated, and saturated fatty acids. Is it normal to have lavender burps while taking Lavela WS 1265? Eructation (burping up) is a common experience with Lavela WS 1265. This experience does not lower the efficacy of the product nor does it cause additional problems. Taking Lavela WS 1265 with food, may help to reduce the eructation. Can Lavela WS 1265 be taken with food? Yes. Lavela can be taken with or without food. Less eructation occurs when taken with food. Instructions include drinking a full glass of water with the soft gel(s). Can the softgel be bitten open? The softgel can be safely bitten open, if desired. However, Lavela is a very potent essential oil and the taste and odor is very strong. Ideal consumption is to swallow the softgel whole. How quickly will patients experience the benefits of Lavela WS 1265? Every person is different but in the clinical trials, participants experienced changes within the first several weeks. Are there any drug-nutrient interactions with lavender oil? Caution should be taken whenever recommending, or consuming, nutritional supplements. 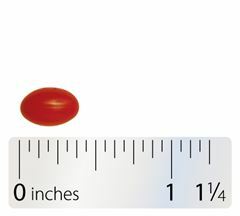 Healthcare professionals can use this drug-nutrient interaction checker to view potential interactions with the ingredients of Lavela WS 1265. Patients should consult their preferred healthcare professional for any supplement questions. How is Lavela WS 1265 different than ordinary lavender essential oil? Lavender essential oil is obtained from the steam distillation processing of the flowering tops of L.angustifolia. The main active constituents of lavender oil are linalool, linalyl acetate, terpinen-4-ol, and camphor. The quantity of these constituents can vary in different oils. If inferior harvesting techniques or sub-par plant material is used, one can still make an essential oil and it will still smell like lavender, but the balance of constituents will be different. Lavela WS 1265 is very well characterized in terms of the content of its various constituents, unique in composition, and the only lavender essential oil with demonstrated efficacy and safety in published, controlled clinical trials. References: Cavanagh HMA, Wilkinson JM. Biological activities of lavender essential oil. Phytother Res 2002;16:301-8. European Pharmacopeia, 6th edition, 2008. Your answer helps us to build a better experience. Your selection will not prevent you from accessing our website.